Tour Route. From the Chinese National Tourist Association Web site. Located in the eastern part of Aisa [sic] and to the west of the Pacific, China is a great country with an inviting charm and an air of Oriental mystery endowed by its splendid culture of unique depth. Covering an area of 9,600,000 square kilometers, China boasts of fantasitic [sic] natural scenes, numerous historic relics and colorful cultures, with 1.2 billion diligent, wise and hospitable people living in this land. The above passage is a quotation from the Web site of the Chinese National Tourist Association (CNTA), an organization maintained by the Chinese government to plan and facilitate travel in China for foreign (specifically, Western/English-speaking) tourists. The site offers a great deal of information aboutand photographs ofChinese and ethnic minority cultures, historical and geographic places of interest, and "traditional" practices such as calligraphy and the martial arts. As such, it provides a rich context for a discussion of contemporary Chinese cultural nationalism. Historians and students alike can examine nationalism and nationalist motives, and explore the metaphors and narrative strategies that both give rise to their development and sustain them. Recent conflicts in the Balkans have drawn issues of nationalism and cultural identity into sharp focus in Central Europe, but most of what we read and see is filtered through the lens of our own news media. The Internet, however, allows us to "go to the source" in a simple and rapid wayinto the world of "official" sites maintained by the governments of various nations. Additionally, "official tourist sites" portray nations at their nationalistic best, as they sound their own trumpets in an effort to attract consumer dollars. Selling a nation first requires the manufacture of a national identity, a consumer construct that is integral to the project of nation-building. In the course of this short "webnography," I will examine Chinese cultural identity as it is formed and re-formed in www.cnta.com’s various pages, and look at some of the ways in which nationalism and global capitalism meet in the arena of foreign tourism. Exploration of these two issues can enlarge our understanding of official nationalism, and of the Internet as a burgeoning medium for such a message. Dos & Don'ts. From the Chinese National Tourist Association Web site. The www.cnta.com Web site is an example of "discursive cultural nationalism"i.e., it is a verbal rather than physical manifestation of national identity. It is a government appropriation of "Chineseness," packaged and sold to foreign tourists. Color pictures and interactive maps, cute icons and graphics (pandas, elephants, animated musicians, and more), all depict a friendly yet exotic destination for the foreign traveler to China. This China is depicted as a unified whole, and yet it betrays a dichotomous quality: traditiona codified culture normally celebrated in and relegated to museumsis summoned as a source of exotic entertainment for the tourist, who, in turn, is relieved by the news that hotels and other accommodations meet her or his very high modern standards. "[A]s China’s economy booming at a miraculously high speed, the ancient oriental country is shining with dynamic modernazation [sic] moves." The foreign tourist, it seems, craves exotic tradition but requires familiar modernity. People of China. From the Chinese National Tourist Association Web site. The Chinese National Tourist Association is quick to demonstrate, in addition, that China is a happy family composed of 56 different "nationalities." The expression of cultural identity in China, therefore, is one composed of multiple cultures, all of which reside harmoniously under the umbrella ofwhat? The "People’s Republic of China" is not a phrase that appears anywhere in the site itself, nor do the words "communism," "socialism," or even "government" (the page specifically devoted to Hunan province does not even mention Mao Zedong). There is no state to be found in tourist China; socialism, it seems, does not sell. Thus the first point to be made is that www.cnta.com is stripped clean of any trace of political controversy; even reference to Hong Kong"[t]he return of Hong Kong the Oriental Pearl of the Motherland means a lot to China’s tourism"attributes no action, motive, or context that might invoke criticism; www.cnta.com presents a stateless nation, a self constructed entirely of "culture," geographic attractions, and hotels. The www.cnta.com site reveals, in addition, that any definition of "nation" is never fixed. Historian James Townsend states that in contemporary China "four different Chinese nations continue to exist": the first is composed of all People's Republic of China (PRC) citizens; the second is the PRC’s Han nation; the third consists of the PRC plus Taiwan, Hong Kong, and Macao; and the fourth consists of overseas Chinese who retain some idea of dual nationality. I believe that Townsend’s thesis proves to be a very useful way to study modern China, as is demonstrated by the multiple Chinas summoned by the CNTA in its tourist literature. "China is a country with 56 nationalities such as the Han, the Manchu, the Mongol, the Uygur, the Zhuang, the Tibetan, and so on," the site states. This corresponds to the "first Chinese nation" as defined by Townsenddescribed as a "happy family" elsewhere in the Web site. Not surprisingly, Hanaccounting for more than 90% percent of the PRC's populationis the first "nationality" to appear in the list. Thus, one of the Chinas summoned by this state organization is a multi-ethnic collective, a China whose boundaries are "soft" enough to encompass ethnic and cultural diversity. Chinese National Tourist Association Web site. Additionally, the CNTAin keeping with official state policyincludes disputed territories within its borders. The third of James Townsend’s Chinas may be seen in the interactive tourist map located at the Web site, which depicts the nation as divided into several color-coded regions (see map) that are "clickable." A click of the mouse on any of these regions takes the viewer to a page that reveals each region in detailall that is, except Taiwan and the "South China Sea Islands." Moving one’s mouse pointer on these regions does not yield the familiar "pointing hand." Rather, their "unclickability" reveals that while the state considers these teritories to belong to the People’s Republic, the CNTA cannot sell them to tourists. costumes, food, [et cetera]." This statement (and several other similar examples) tacitly assumes a sense of superiority over "simple" cultures with unique "food" and "customs," and in so doing seems to place the Han Chinese on an even par with the Western readerboth are looking at (and down upon) the ethnic minorities from an outsider's perspective. Here we see the commodification of a culture that exists within, and yet different from, the nation-state. Compared to the simple ethnic tribes, it seems to say, you and I are superior. The "internal colonialism" that informs these passages points toward a nationalism that exists with reference to an "other" within the nation-state itself, and creates further problems for our own understanding of nationalism and the nation-state. Ethnic mobilization has always challenged the security of the nation-state, but what happens when the nation-state calls upon a part of itself to assert its own superiority? Richard Handler, in his study of Quebec nationalism, notes that the nation as a collective individual is defined by its possessions, that its existence is demonstrated by the existence of its cultural property. Ethnic minorities seem to serve this function in tourist China; they represent the objectification and appropriation of the "exotic." It is imperialism turned on its head the Chinese assert their own superiority by offering up an exotic "other" that exists within their own state. For any student doing research on "official" or "state" nationalisms (as defined by the historian Benedict Anderson, among others), tourist sites such as this one—and the "nation-for-sale" attitude that they assume—provide a myriad of easily accessible primary resources. From the Chinese National Tourist Association Web site. 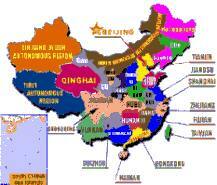 China is one of the earliest civilized countries in the world with a recorded history of over 4,000 years. As a worldly known fact, the Ancient Chinese invented the Compass, the Gunpowder, the Paper-making and Printing Skills, which greatly furthered the development of human society. In the long history of thousands of years, the unique Chinese culture, living style and custom take form and thus make China a charming tourist destination. The above passage is telling for two reasons. First, it asserts the cultural superiority of the Chinese, who possessed the means for travel, war, and mass communication centuries before the West. Where would imperialism be without the Chinese, who invented the essential tools for world conquest? And why did the Chinese not follow this course themselves? Because, the reader is reminded, the Chinese peopleas the opening quote notesare "hospitable and courteous." Second, the "long history" which so "greatly furthered the development of human society" is a Han Chinese history; it is the Han people who have progressed through time, who have retained their traditional customs and "folklores" while modernizing at "a miraculously high speed." This is the second of Townsend’s Chinas, the "Han-PRC nation." The narrative landscape of such a history, however, is completely flatit is indeed a "four thousand year old history," but one that exists only in contradistinction to contemporary history, and has no contours of its own. Ming, Qing, Qin: dynasties leave their relics behind, but beyond that do not contribute to the progressive flow of time. 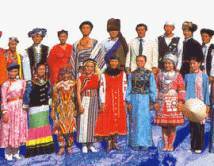 The ethnic minorities, in contrast, have no narrative at all; they are timeless and unchanging, possessors of unique and simple costumes and customs, and used as a commodity by the state. "Tibet is mainly inhabited by Tibetans. The Tibetans are a courageous and hard-working people, with very old and unique culture. . . . Tourist attractions include the Potala Palace in Lhasa, Jokhang Temple, and a number of Buddhist sacred places." This passage points us towards the repressing function of such characterizations of the nation, of such grand narratives that posit a modern Han people at the expense of "simple" peoples whose voice has been silenced, of the absorption into a larger nationalist narrative of common historical experience. 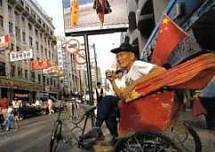 There is no narrative of conquest, no trace of the destruction of the "old and unique people" whom the PRC purports to represent. "Tibet is mainly inhabited by Tibetans." The Korean people are all good singers and dancers. . . . Not only the young people in Yanbian sing and dance well, the elderly and children do well too. On jubilant occasions often a whole family is turned out to dance. . . . The Koreans also love sports. . . . Playing on the swing is a tradition of the Koreen [sic] women. Tourists will see them swing at the entrance of their villages of on [sic] the threshing grounds, their colorful gowns flapping like beautiful butterflies. One is tempted to draw parallels with the stereotypes of African Americans as "good singers and dancers" and athletes that have conspicuously pervaded American society throughout its history, and thus conclude that the sentiments expressed in the passage above reflect a racist view of Koreans. But it is impossible to determine whether there is a racist or culturalist sentiment that is at work here, or a mixture of both. It is worth noting that the "official histories" offered up by government Web sites such as www.cnta.com warrant future scholarly attention, if only for the questions such primary sources raise about our own role as objective narrators of the historical past. To look briefly at another example, the official tourist site of Uganda offers a history of that African nation that might raise an eyebrow if its contents were cited in a research paper written for a high school or college undergraduate class. Much attention has been paid to the credibility of various Web sites as research materials, but in what ways should such concern extend to governments telling their own stories? One might wish to incorporate such materials into teaching by asking questions such as the following: How would a Western scholar’s history of this country differ? How might a Bantu historian describe these same events? It must be remembered that Web sites such as these (as well as all historiography), are primary as well as secondary sources. They may serve as a source of reference, but they also speak of the conditions of their own production. The Chinese National Tourist Association Web site allows us to see competing images of China that exist within a single "text" produced by the central government; if we are to talk about Chinese nationalism, it is useful to think of historian Prasenjit Duara’s idea that nationalism is best thought of as a relational identity, a site of competing representations and allegiances that are constantly in flux. To construct, for example, an image of "China" as encompassing several nationalities while implying that "China" is to be compared to the "simple" ethnic minorities that reside within it points to two very different and contradictory usages of the same term. Nationalism is defined in terms of an "other," but the "other" may determine which "self" is summoned as well. Regional identities and competing narratives ("northern," "southern") of Chineseness all lead us to concludein the words of Duarathat "what we call nationalism is more appropriately a relationship between a constantly changing Self and Other, rather than a pristine subject gathering self-awareness in a manner similar to the evolution of a species." And, Duara might add but does not, these relationships may shift within a single textwitness the nationalist boast of inventing gunpowder and the printing press, with the "other" clearly the West, versus the "othering" of the ethnic minorities with their simple festivals and folklores. Ethnic cultures exist primarily to represent frozen tradition and a point of comparison with Han culturethe Uygur will not be building resort hotels any time soonand, in the context of foreign tourism, to provide the exotic and "oriental." Not only are there changing "others" and "selves" in the creation of national identity, there are also shifting audiences that must be accounted for. In the former, the internal audience is a captive one, and national identity is informed by an erasure of difference; in the latter, the external audience is sought out, and national identity is informed by articulation of difference. It is perhaps useful, then, to regard nationalism as a matrix of changing relationships, but one from which we can extract meaningful representations of the "nation-views" that help define the nation itself. Finally, it must be noted that the English-language version of this site is, on the basis of a brief examination, essentially a translation of the original Chinese site (although the Chinese site is far slicker in design). Neither time nor space permits a detailed comparison of the two, but we may readily see how nationalist rhetoric is mobilized to instill pride in a nation’s citizens, as well as to project a certain identity to the outside world. Thus www.cnta.comwhich one might use to plan a tour, learn about "Chinese customs," or discover Szechwan cuisinemay be considered as a site of contesting views of one modern nation-state’s identity, and therefore should be required "visiting" for all students of East Asian nationalism and history.